Silhouette makes great inchie envelopes! One of the June swaps I participated in was” inchie envelopes”. There was a template available for one, but I wanted to see if I could come up with something more interesting. Enter my Silhouette! For several of the envies I just took square envelopes and resized them to 1.25″. Super duper easy! The turquoise and red one is actually a CD holder. The pink and brown one with the flower flap and the purple one with 4 scalloped sides and belly band were ones I made myself. They were easy to make as well and add a little sizzle. Here is a picture of the back sides of the envies. Fun little birds and flower cut-outs embelished the envies. Here are the twinchies I swapped this month. The bird is a Print and Cut and I made the french “bird” label using the 2 piece frame and some text. Heart, lace border, and tiny tag are die cuts as well. One of the members of my Yahoo Inchies 1×1 group, Juliet, sent me a clever inchie folder. I loved it but it only held 2 sets of 4 inchies each. It was great for our mingles, but our swaps were 6 inchies each so I wanted something that would hold multiples of 6. This folder holds 6 sets of 6 inchies each (36 inchies total) and fits into a standard business size envelope (4 1/8″ x 9 1/2″). I started with a piece of Bazzill cardstock because it is a good heavy weight. I cut it to a rectangle that was 8″ x 9 1/4″ and folded it to make a 4″ x 9 1/4″ folder. I used lightweight decorative paper for the inserts. 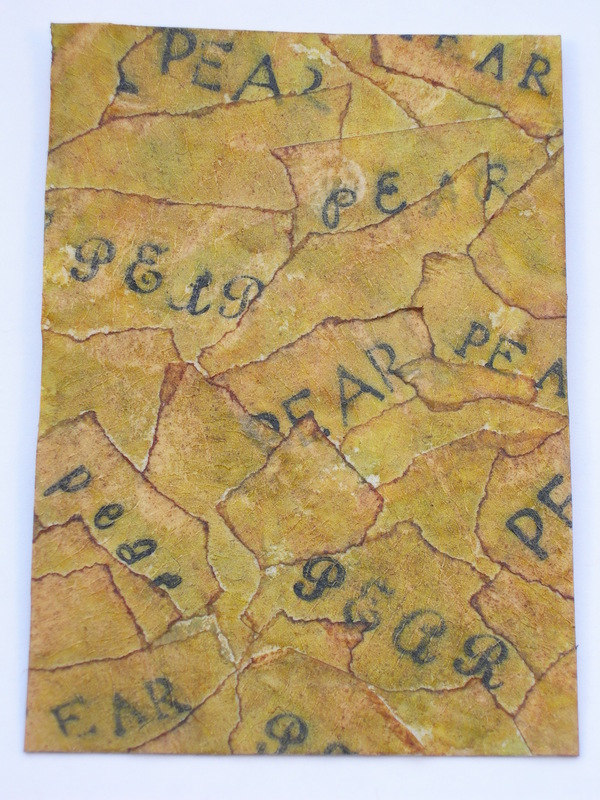 I cut 6 pieces that were 4″ x 3 3/4″ and then folded the short edges down 3/4″ . I ended up with inserts that were 3/4″ x 2 3/8″. To attach the inserts I first ran a line of glue on the backs and then placed them evenly inside the folder. To make the pockets I measured off 1 1/4″ spaces and then placed staples there. I will someday try running lines of sewing down the pockets instead of staples. This would keep from having the bumps that you get with the staples. I’m just not sure how sturdy the pockets would be. If someone tries this , let me know how it works. The Mile High Polyer Clay Guild had an inchie swap this April. These are a few of the inchies I made. These are a few of the inchies I received. The diversity of techniques was amazing: faux raku, mokume gane, textures, transfers, tiny fish canes, flower canes, faux malachite, multiple layers of color covered with resin, lots of PearlEx and some awesome 3D ones. I loved this swap! In everyone’s card making endeavors will come a time when a mistake is made. Mistakes are frustrating, but not fatal. Here are some ideas to help you deal with those mistakes. 1) Cut off the front panel, trim it down to a smaller size and apply to a coordinating color blank card. 2) Rotate your card 90 degrees . 1) Walk away from it for a while. 2) Add more stuff to it. 1) Cut or tear the card front into pieces and use to make serendipity squares. 2) Cut the pretty parts into ATC’s, moo cards or inchies. 1) Give up and throw it away after salvaging all you can off of it. Wahoo! I just got a Silhouette SD for my (early) birthday! So far I love it. Perhaps a little explanation is in order for those who aren’t familiar with the Silhouette. It is an electronic die-cutting machine that hooks up to your computer. You pick a pattern or letters, size it to you specifications, and send the info to the cutter, and just like that you have your design. I knew that it worked well for large formats but wanted to see if it could do a good job on inchie-sized projects. The answer is definitely yes. I was very pleased that most of the patterns I picked cut beautifully at the 1″ size. On the top row the leaf, the dragonfly, and the bird were all cut using the Silhouette. The bottom row shows the sparkle, the heart, and the flying bird. The heart looked like like it needed something else so I just poked holes in each iof the scallops and added embroidery thread. 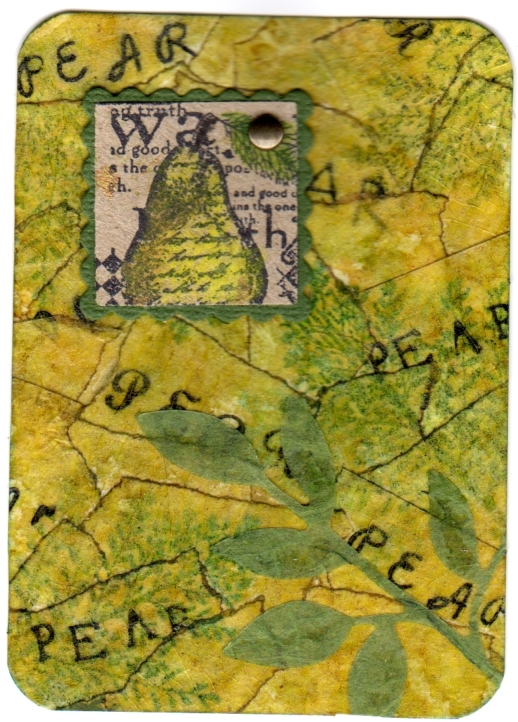 On this ATC I used the Sil on the leaf (the same one as the one above) and the letters . One of the biggest reasons I wanted this machine was to cut letters and phrases to my specifications. “Imagine” was a design that was available to download from the Silhouette Store. The store has hundreds of designs to choose from. They are quite inexpensive and once downoaded, are yours forever. There are other sites on the web that offer free designs as well. Now who wants to come to my house and play???? One of the May swaps for my “Inchies 1×1” group was an ATC with a masking tape background. 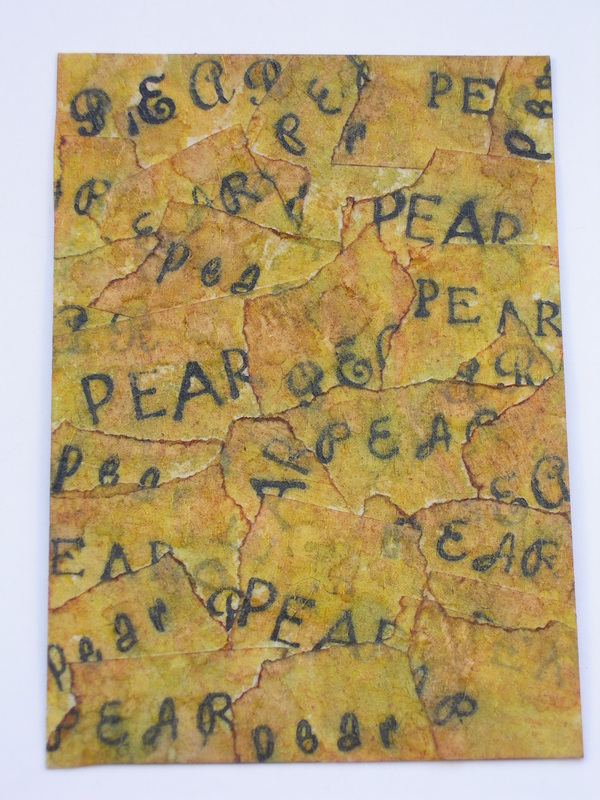 Since I would be using a pear inchie on the ATC I wanted to incorporate the word “pear” into the masking tape. I could have just made my masking tape background and then stamped the word on the top, but I wanted the background to have more depth. I started by taping a piece of freezer paper, shiny side up, to my work surface. I then placed strips of masking tape side by side on the paper. 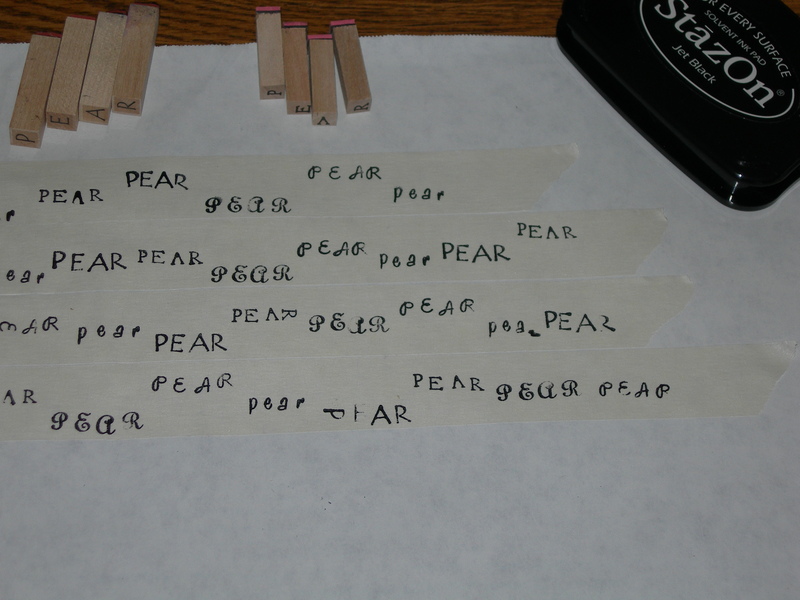 Using Stazon ink, I stamped “pear” with several different stamp sets on the tape. As you will notice, I goofed and stamped some letters the wrong way. Since I was going to be tearing the tape into pieces I could throw the bad bits away. After the stamping was done I pulled the stamped tape off of the paper and began adding torn pieces to the cardstock ATC backing. A note here: originally I used only tape that was stamped with words on the ATC, but it seemed too busy for me so, I decided to use a mixture of stamped and plain masking tape. I liked that result better. I chose to color my background with alcohol inks (Adirondak and Pinata), then swiped a brown Memories ink pad over the entire ATC. With the addition of some stamped ferns (Hero Arts) and die- cut leaves (Sizzix) the ATC itself was ready for the inchie. 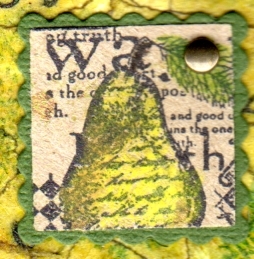 I stamped a collage image (Stampers Anonymous) onto kraft paper and then cut the pear portion out, colored it, added a brad, and backed it witha small scalloped square die cut (Spellbinders Nestabilities). Have a happy, crafty week, and don’t forget to embellish !